On Thursday, I will begin a “Thursday Thanksgivings” series in which I list what I am thankful for each day of the past week. I started this endeavor on my weight loss blog and wanted to copy the original post that started it all onto Veronica’s Cornucopia so you will have the story and the background behind my thanksgiving resolution. I adore this picture. The big, genuine smiles. 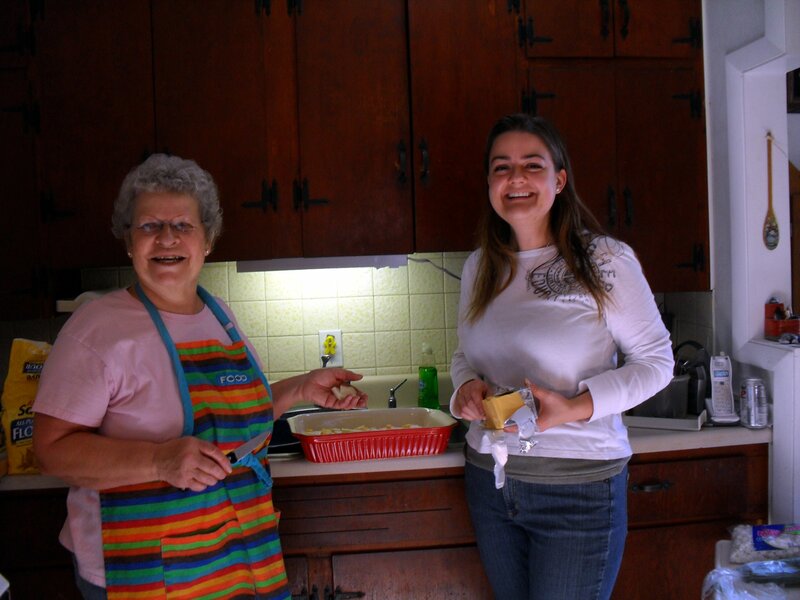 My husband took it while my mother-in-law and I were preparing scalloped potatoes from her old recipe file that she’s had since she got married 48 years ago. Phyllis is one thing that I’m hugely grateful for on this day of thanks. Making scalloped potatoes with her makes me happy in such a ridiculous way that is hard to describe. I won’t get into my childhood, but let’s just say that Phyllis is the kind of mother I always wanted and I’m so thankful to have her in my life now. I’m thankful for my own mother as well, who I know loves me dearly, but it is much more difficult to find this deep-seated happiness when sharing a kitchen with her. Our scalloped potatoes (in the red dish) turned au gratin with the addition of some Velveeta. Also pictured: sweet potatoes (two kinds), scalloped turnips, and smoked turkey. Today was a good day. God has blessed all of us abundantly, and recognizing these blessings is something I need to do more often. Therefore, I have decided to make a Thanksgiving resolution. From now until Thanksgiving next year, I’m going to find something to be thankful for every day and do a recap every week to keep myself accountable to this resolution. Here’s to more enjoying what I have and less complaining about what I don’t! 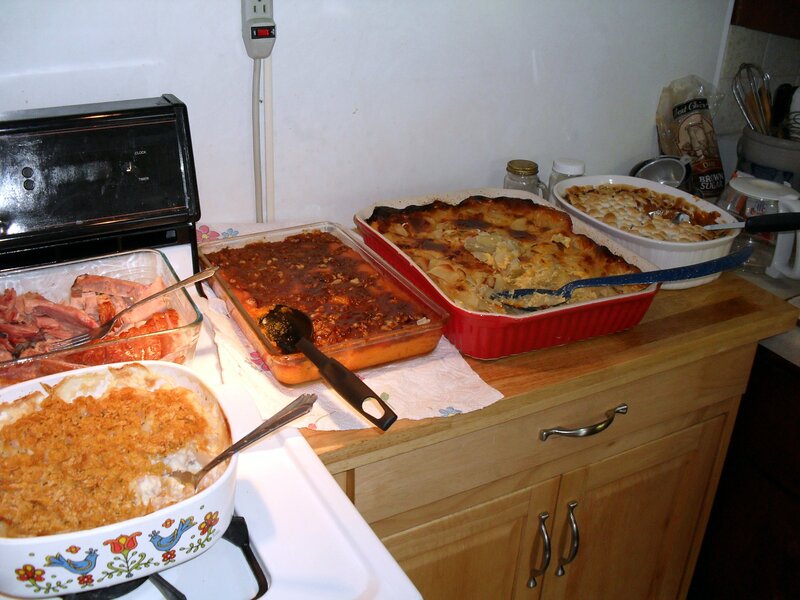 Past weekly thanksgivings can be found here. Posted in Thanksgivings and tagged giving thanks, resolution, thankful, thanksgiving. Bookmark the permalink. Glad you’re still having the Thanksgiving posts! I like these! Wonderful post and picture. Some people are just more at-home in the kitchen than others and it appears you and your mother-in-law are really happy to be there. The dinner looks so good. I definitely remember this post — I love that first picture of you and your mother in law! Great series, Veronica…reminds us to be thankful all year long. Keep on giving thanks, my dear friend. It really works wonders to the soul. She is someone I met through my blog. Thank you both, you are sweet hearts! Love your blog! Having an attitude of gratitude is a good idea! It always feels good to see things in writing! I love old recipes like the one in the photo. 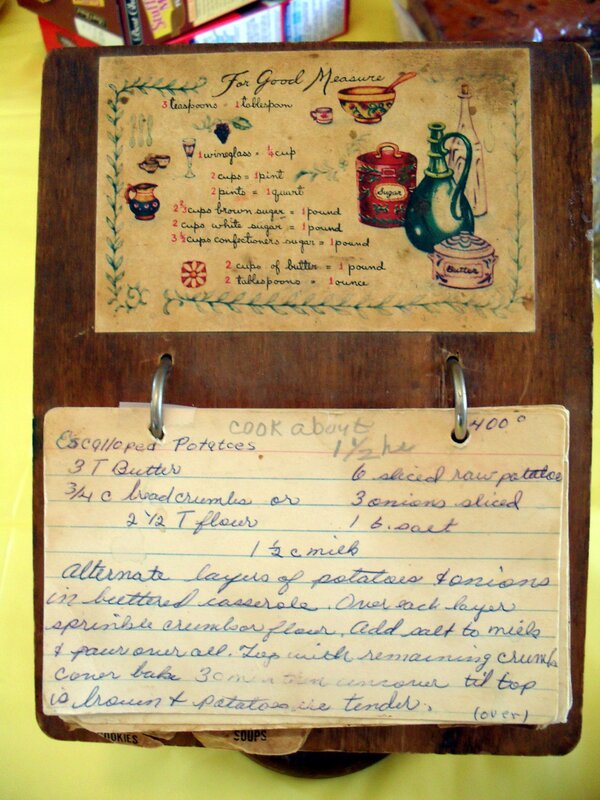 I have lots of hand written recipes from my Grandmother and I cherish them.